Feeling alone with your site? If your web site is not getting any traffic, you can't make sales or generate leads. And if you are getting traffic and no one is signing up on your mailing list or contacting you. . . well, why do you have a web site? The first generation web sites were "online brochures". In layman's terms a pamphlet converted to a web page. Then we entered the world of "Beauty Web Sites". You know, like the award winning commercials, gorgeous design and images that left you in awe, but what business were they generating for the site owner? My clients all want the same thing. . .
HELLO! Isn't that why you went into business? So if you are feeling trapped, kidnapped, crying out for help and need any of the above (contacts, clients and sales), that's what I do. 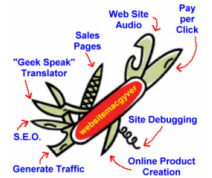 My clients often call me the "Website MacGyver" because by using everyday simple Internet technology I create solutions to get them out of a jam or turn a non profitable web site into a real marketing tool. You can't see it. But it fits in the palm of your hand.